Additional Notes: MALE: Husky, adult, white coat with some dark shading, wearing an Ecollar, no tags. MALE: Husky, adult, black and creme coat, wearing an Ecollar, no tags. 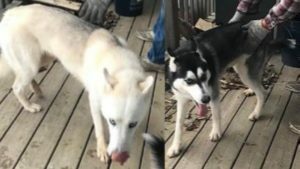 BOTH found roaming on April 6/19.